EAST HARTFORD, Conn.–Pratt & Whitney, a division of United Technologies Corp., announced that it will invest approximately $386 million in its Columbus, Georgia, facility to increase the production of parts and maintenance services and to reduce costs for new and existing engine programs. The investments will go toward the purchase of automated machinery and equipment upgrades and construction of two new buildings on the property, the company said in a press release. Construction will include a 200,000-square-foot facility to overhaul GTF engines. A 20,000-square-foot specialized manufacturing facility and related infrastructure will also be built to house a new isothermal forge press that will be used to manufacture turbine disks and compressor rotors for Pratt & Whitney engines. Other upgrades to equipment and machinery are also planned. "We're investing heavily in our Columbus facility to support the increased production and services planned for our F135 and GTF engines," said Chris Calio, president, Pratt & Whitney Commercial Engines, in the release. "This investment will help ensure that we have the appropriate infrastructure, tooling, and trained workforce in place to provide the best products and services to our customers worldwide. The tremendous support we receive from the community and state have contributed to our success in Georgia." "Pratt & Whitney has maintained a presence in Muscogee County since 1984, and this latest expansion speaks to Georgia's support for our robust aerospace industry," said Georgia Gov. Nathan Deal, in the release. "Georgia's pro-business structural framework and deep talent pool help to retain industry leaders such as Pratt & Whitney. By adding these new high-quality manufacturing jobs, Pratt & Whitney is making a significant investment in the Columbus community, and we look forward to strengthening this longstanding partnership as the company continues to grow." Pratt & Whitney (www.pw.utc.com) has also expanded its relationship with Columbus Technical College to provide new and existing employees with robust training programs. The school will offer four- to nine-week programs focused on aerospace mechanics and advanced manufacturing technologies to better support the company's growth. This is one of several skills development programs the company has in place with community colleges and technical schools throughout the U.S.
"This announcement from Pratt & Whitney is the latest example of the hard work put forth every day by our economic development team locally and the professionals at the Georgia Department of Economic Development," said Brian Anderson, president & CEO of the Greater Columbus Georgia Chamber of Commerce. "The project would not have happened without the tremendous relationships we have with the local Pratt & Whitney leadership team here in Columbus, as well as those at both Pratt & Whitney and United Technologies Corporation in Connecticut." The Columbus Engine Center maintains PW1100G-JM, V2500, PW2000, F117 and F100 engines. 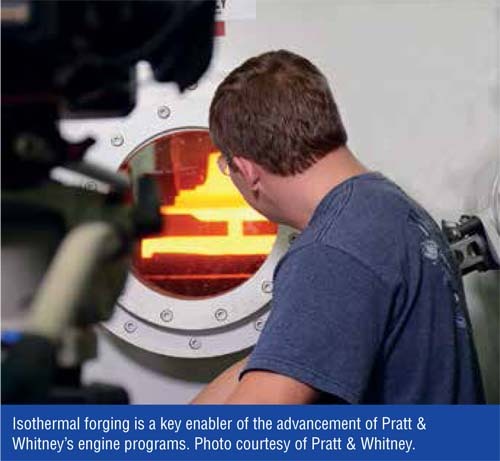 Columbus Forge produces compressor airfoils and nickel and titanium forgings, which are machined into critical rotating components for Pratt & Whitney's military and commercial engines. Both facilities are located on one campus about 90 miles south of Atlanta. Pratt & Whitney designs, manufactures, and services aircraft engines and auxiliary power units. United Technologies Corp., based in Farmington, Connecticut, provides high-technology systems and services to the building and aerospace industries.